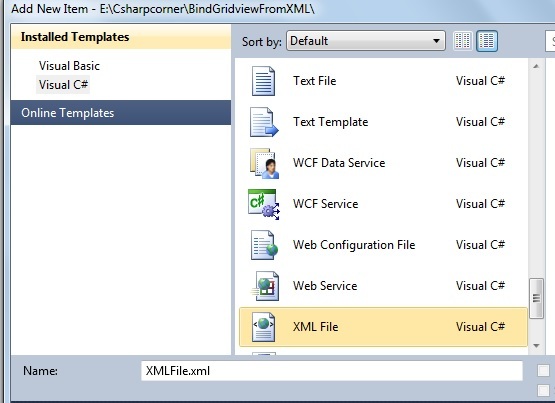 There is often a need for applications to bind a Grid View from an Extensible Markup Language (XML) file that is widely used to communicate for cross-platform applications. To learn more about XML please refer to the many articles and books in this web site. Let us see the procedure for creating a XML file so students can understand it. 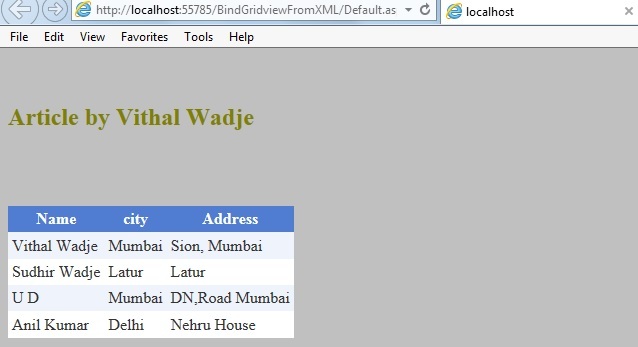 Give the project a name such as "BindGridfromxml" or another as you wish and specify the location. Then right-click on Solution Explorer - "Add New Item" - "Default.aspx" page. Drag and Drop one grid view to the Default.aspx page. Then the page will look such as follows. In the preceding sample code the Custmorinfo tag represents the table name in the data table and Name, City and Address represents the column name. When you want to add records then you need to add a row within the Customerinfo tag every time. From the preceding example it's clear that the Customerinfo tag represents the table name in the data table and that Name, City and Address represents the column name. We are now done with the code, now run the application and the output will be as follows. I hope this article is useful for all readers, if you have any suggestion then please contact me including beginners also.